Hot Licks flame thrower kit for vehicles or motorcycles with single exhaust comes 100% complete with everything you need to install the kit and shoot flames! 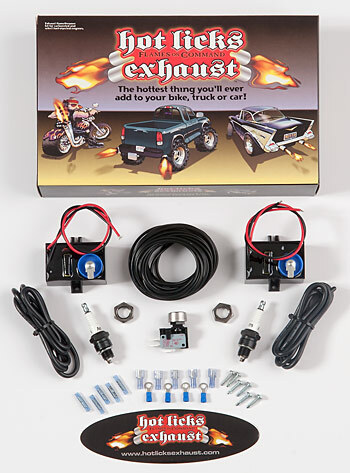 The basic kit by itself will give you 6-24 inch blowtorch afterburner flames depending on the size engine you have, if it is efi or carbureted, and depending on what aftermarket modifications you have done to your engine. If you want bigger wilder flames that are 3-6 feet plus you will need to also purchase the "Mega Flames Plans". The plans will show you how to purchase and install additional components along with the basic kit to achieve the larger wild flames. Contact us with specifics about your applications to find out how big of flames you can expect and to find out if it will even work on your application. Other sites only sell you partial homemade cheap kits. Who wants to order a kit and then go shopping locally for the rest of the kit? Hot Licks flame thrower kits are designed with solid state electronic circuitry outlasting and outperforming all other kits on the market today and come with a lifetime warranty proving that we are the leader in flame thrower technology. Other sites offer at best a 30 day warranty and at worst no warranty at all. So buy the best and forget the rest (cheap partial kits that may or may not work.) The only question left to ask is...Have you Got Flames? NOTE: Basic Hot Licks Exhaust Inc. does not guarantee that the Basic Hot Licks Exhaust Inc. Flame Thrower kit will work on all vehicles. Some modifications may be required (see F.A.Q. page for more info). Email or call to make sure your application's exhaust system is compatible with our kit before ordering if you have any reservations.